Storm Callum in Kendal. Photo ©2018 Mark Stafford. Last weekend was my one and only festival appearance this year, at LICAF, the Lakes International Comics Festival in Kendal, held over the weekend of 12th-14th October 2018. Invited by Meanwhile… publisher Soaring Penguin Press at a relatively late stage, it gave me a chance to hook up with chief penguins John and Cheryl Anderson before their impending relocation to Vancouver. 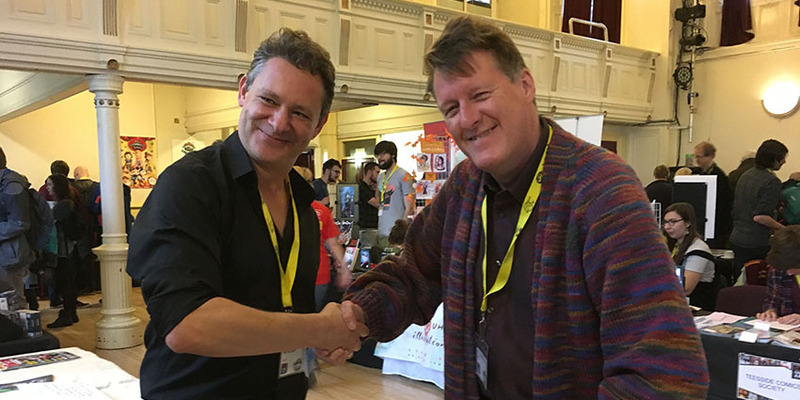 It also enabled me to reacquaint myself with their new co-publisher, Tim “Bad Cop” Pilcher, to discuss plans going forward, as well as witnessing the historic signing of the contract between the new partners. It was a soggy start, to say the least. 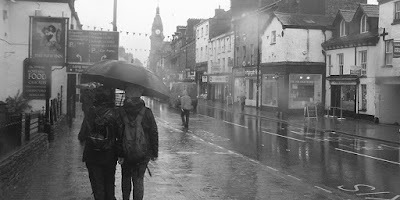 Arriving on the Friday evening after a five hour train journey, just as the heavens opened and the wind started to blow. Storm Callum was a deluge of biblical proportions which unfolded over the next thirty-six hours or so and led to roads flooding and serious concern from some locals that the River Kent might burst its banks again, as it did less than three years ago, causing extensive damage. Popular wisdom suggesting that getting a taxi from Oxenholme station would be a more efficient solution compared to continuing directly to Kendal proved unfounded, as everyone else had the same idea. There were no taxis to be had for almost an hour from the station, and rail travel was suspended for a while. Tim and John shake on it. Eventually the taxis came and from Kendal high street I kayaked my way to the Brewery Arts Centre to collect my guest badge, but due to the call of hot food, missed the announcement of Hannah Berry being announced as the new Comics Laureate, taking over from dead man walking, Charlie Adlard. 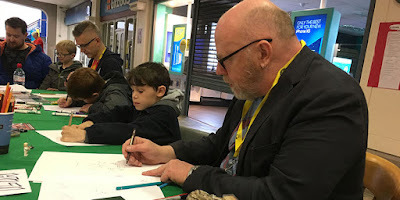 Possibly the most memorable part of the weekend (apart from the rain) was to finally meet Canadian superstar cartoonist and designer Seth at the bar in the Brewery Arts Centre. This was quite possibly the only event we’ve both attended at the same time, although his business card looks very familiar. 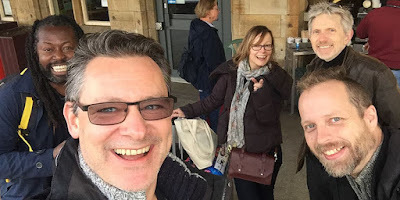 It was also the first time I’d met the much lesser-known and definitely non-Canadian Martin Simpson (aka “Simo”) and his wife Tish, but Martin’s time will come. I’ve been a huge fan of his since pledging to his Kickstarter anthology Misc, to which he's added his Meanwhile… serialised Needleman collection and some spectacular prints. The rain continued to fall throughout Saturday, and understandably, this put a literal damper on things. Once everyone’s footwear has dried out though, people really started to enjoy the festival. This was my first trip to LICAF since 2014, and the event has matured a great deal and embedded itself into the community, with a huge Comic Art Trail in the form of dozens of window displays throughout the town. ILYA's fun family workshop in the Westmorland Shopping Centre. I spent most of the weekend perched on the end of the fun-packed Soaring Penguin Press table, upstairs in the impressive Clock Tower, sandwiched between John Freeman (celebrating twenty years of his Down the Tubes website) and extraordinarily talented newcomer Jessica on Paper. As always, old relationships were renewed and new friends made. Among those whose paths I crossed were the pop culture hound himself, Chris Thompson, always smiling Doug Braithwaite, found Room to Love ILYA, Tripwire’s Joel Meadows, and festival organiser, the great Dane, Árni Beck Gunnarsson. I haven’t seen Árni for about fifteen years, and whose non-regional-specific accent remains uncannily English, yet even moreso. I caught up with another blast from the past in the form of Littlehampton design guru Brad Brooks, and Flix Gillett (promoting his new Mockingbird collection) with whom I once sat on a panel at the Comic Creators’ Guild Small Press Show, held in a London pub called The Cartoon Page way back in 1996! It was also good to meet another creator new to me, Emmeline Pidgen and and her imminent fiancee, write, musician Andrew Jolly. I found fellow Meanwhile… cronies David Hine and Mark Stafford ensconced on the Self Made Hero table promoting their gorgeous new book Lip Hook, and browsed the mouth-watering, jaw-dropping selection of graphic novels brought to the festival by Page 45’s Stephen Holland. Stephen and I reminisced a bit, particularly about the dear departed Terry Wiley and his erstwhile cohort, the thankfully still alive, Dave McKinnon. Then there was the always effervescent Jessica Martin, the somehow increasingly comprehensible Jim Stewart and Ben Dickson showing off his monumental New Jerusalem. Great to see David Hitchcock, table-less and floating free around the convention with his gorgeous Signalman book, hardy Lakes perennial Sean Phillips (visiting with his son Jacob, a real chip off the old block) and the esteemed Doctors Bryan and Mary Talbot. Shackled to the table for most of the weekend, I managed to sneak away on Saturday lunchtime to see Bryan and Mary’s presentation of their upcoming graphic novel, the rather appropriately named Rain. Saturday evening’s New Talent presentation at the Brewery Arts Centre boasted presentations by Jenny Robbins (Biscuits), Sabba Khan (Pluralism) and comics’ most handsome man Owen Michael Johnson (Reel Love). They were followed by Tim Pilcher announcing a new initiative, Breakthrough, aiming to give disenfranchised voices a chance at developing a career in comics. Possibly my biggest regret was missing Brian Gorman’s One Man Bond show - every James Bond film singlehandedly performed in sixty minutes - again, due to dinner - but Brian and I hung out a bit later. To complete a damp but cram-packed day, I was part of the audience thoroughly entertained by Marc Jackson (Grow a Pair) and Nick Connor‘s funky fresh hip-hop band The Dopes who delighted audiences at Ruskins Bar for minutes. What’s your favourite finger, indeed. The rain finally dried up on Sunday, and the sun even peeked out in the late afternoon, transforming Kendal into a different place. I congratulated the Sergio-Award-winning Hunt Emerson, did a little bit of business with Tony Bennett of Knockabout Comics, and caught up with his glamorous assistant Nora Goldberg-Fourrel De Frettes. 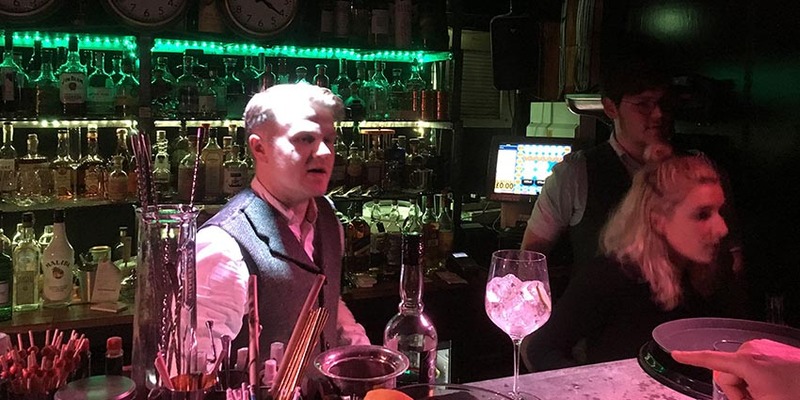 Winner of the Best Worst-Kept Secret Award went to the super not very secret speakeasy on [redacted] Street, to where the select few of nearly everybody gradually found their way sooner or later. Hidden bell-rings, spectacular cocktails, charming bar staff, table service and free snacks contributed to an unrivalled retro-ambiance. Here I was finally introduced to the very dapper Englishman in San Diego (in Kendal) Leonard Sultana, another fellow mojito fan. Waiting for the train. Photo ©2018 Tim Pilcher. So, finally, after all the farewell hugs, Monday morning came, and it was beautiful, bright and sunny. I hooked up with Tim Pilcher and Ben Dickson to catch a taxi to the station where we bumped into Yomi Ayeni Yomster and Claire Wearn. And as luck would have it, on the train journey home my booked seat was directly opposite Seth and his wife Tania. It was a very civilised end to a chaotic but hugely enjoyable weekend, and I must acknowledge all the hard work put in by Julie Tait, Carole Tait and all the red shirt volunteers for another supremely well organised festival. More photos on my Instagram feed here.